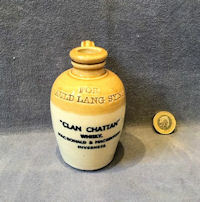 Original, quality 1920's miniature two tone bellied shaped stoneware flagon with a loop strap handle to the rear, incised "For Auld Lang Syne" to the front shoulder and transfer printed "Clan Chattan Whisky Macdonald and Mackintosh Invernell" to the front. Complete and in good order. 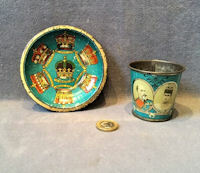 Original, quality small cup and saucer in transfer printed tin issued to commemorate the Coronation of King Edward VII. 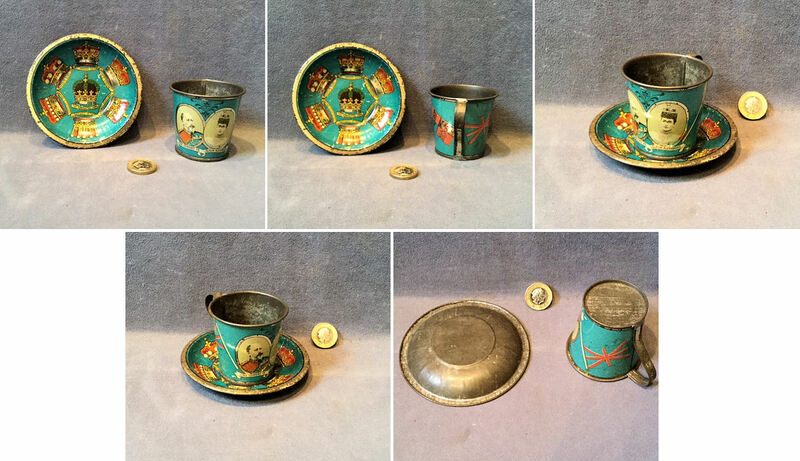 This unusual example, probably issued as a child's size, has printed detail on a blue background, with seven Royal Crowns with the Coronation crown to the centre on the saucer and cameos of King Edward and Queen Alexandra to the front of the cup and two flags on the reverse. Not in mint condition with some minor rubbing to the transfer printing but no dents or damage. 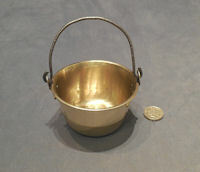 Saucer 4" x 0.5", cup 2.25" tall x 3" wide including handle. 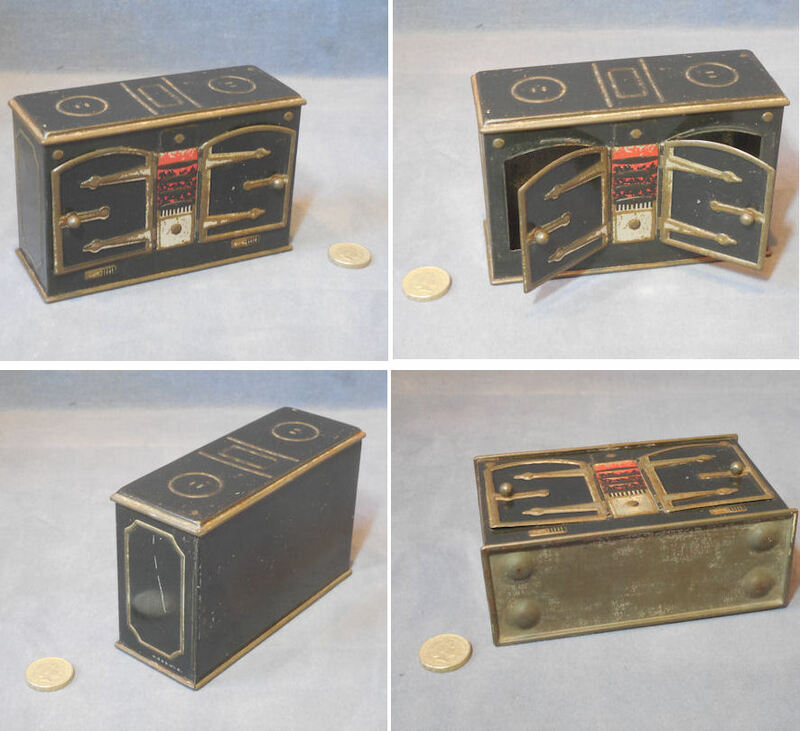 Original, quality 1940's/50's, manufacturer's sample or exhibition model of a three piece cast iron fire front and grate, in a good proportioned, scaled down size. The front bars and ash curfew to the front in cast iron are enamelled in a bronzed finish, and the cast iron base grills on four legs has been cleaned and lacquered. 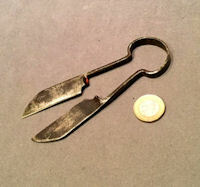 A great item, the first we have seen in this style. 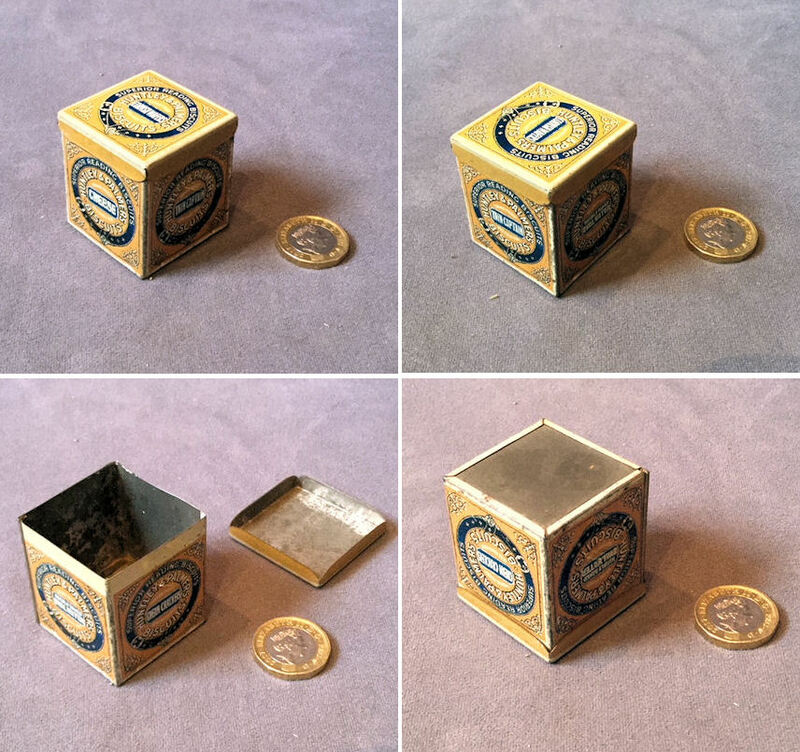 5.75" wide, 3.5" tall x 4.25" front to back. 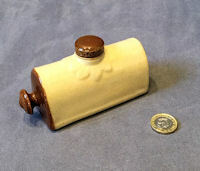 Original, quality 1920's two tone glazed stoneware muff warmer in the form of a miniature footwarmer to be filled with hot water. 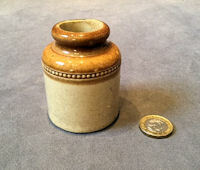 The front and the top stopper are both in dark brown glazed stoneware and the rear end is impressed "Denby of Derby". One minor chip to the threaded section on the stopper otherwise complete and in good and working order. 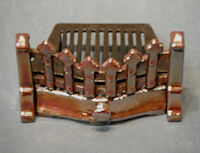 5" long x 2" wide and 2.5" tall. 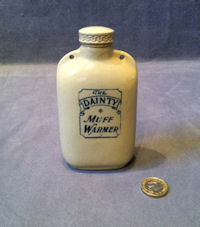 Original, quality 1920's buff coloured stoneware muff warmer to be filled with hot water and carried in the ladies muff or the coat pocket. 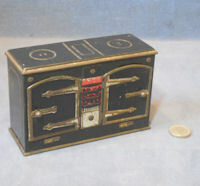 This super example has the original screw in stopper, two eyes to the top for a small brass chain or cord and is transfer printed in blue to the front "The Dainty Muff Warmer". 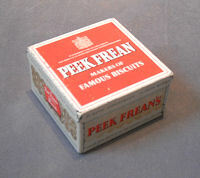 Complete and in good and working order and in mint condition. 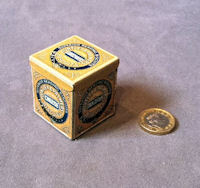 5" x 2.75" x 1.5". 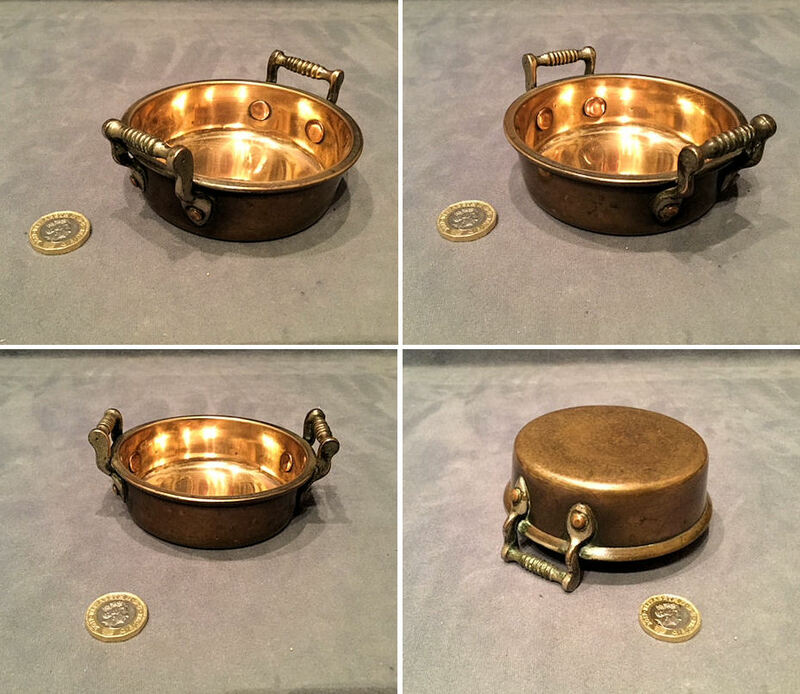 Original, quality 1920's, novelty shaped brass hat pin stand in the form of a mini umbrella stand. 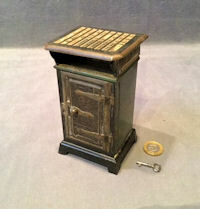 This super clean example has four stems above the plinth with a sliding drawer beneath and a brass grill to the top. 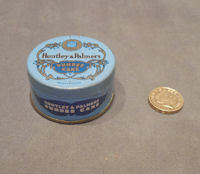 The padded faded velvet cushion to the base for the points of the hat pins is the original and the brass has been polished and lacquered, although the lacquer may be removed at no extra cost. 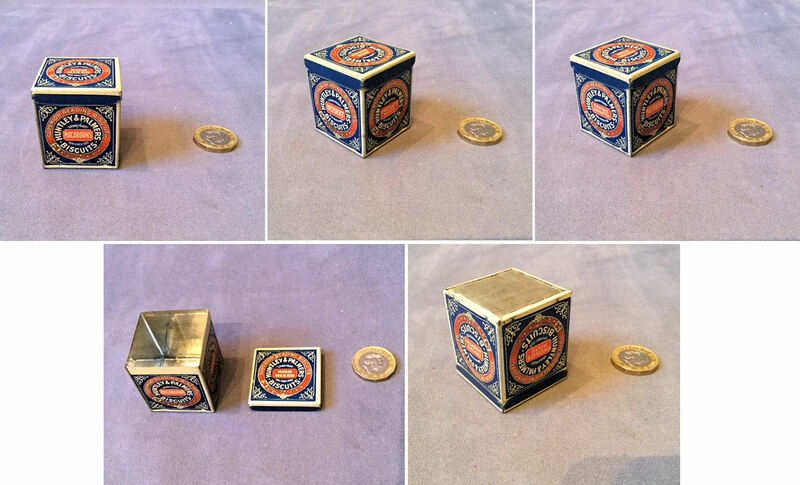 Probably continental and the first we have seen 5.5" tall x base 5.25" x 2.5". 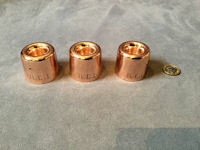 Original, quality 1920's very small copper sponge moulds, each stamped 'R.E.L'. The interiors have good tinning and all are in good usable condition with no dents. 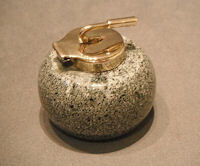 Polished and lacquered, although the lacquer may be removed at no extra cost. Complete and in good and working order. 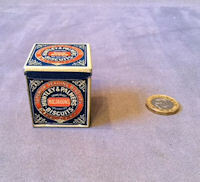 1.5" tall x 1.75" widest. Price is for each. 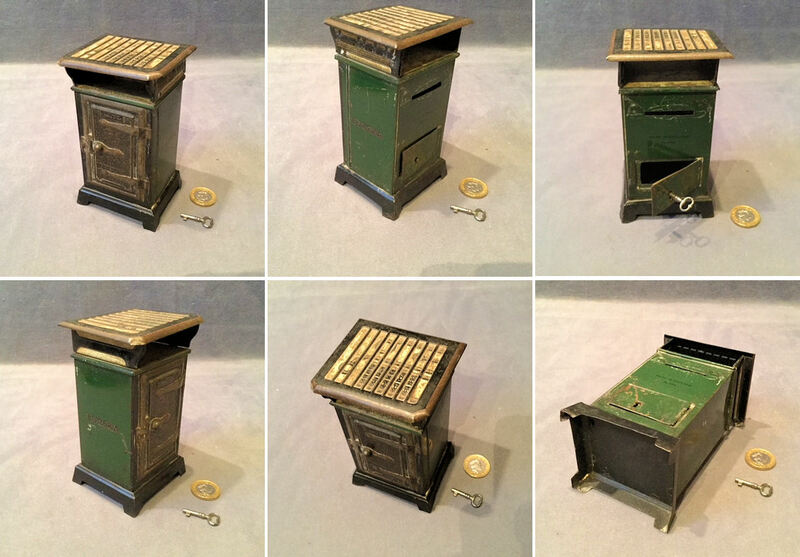 Original, quality, late 19th century, superb, tiny, 'No 2' flat iron in cast iron and impressed in the casting 'No 2' and 'J & J Siddons' and to the handle 'Rd No 573' for the year 1884. 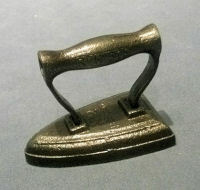 This delightful miniature iron is in superb order and has been cleaned and lacquered. 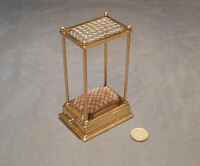 Sole 2.75" x 1.75", total 2.25" tall and 3" long. 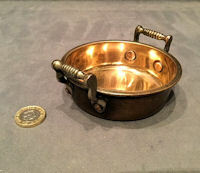 Original, quality, late 19th century, very small, cast brass goffering iron with a wrought iron neck and circular cast iron base. 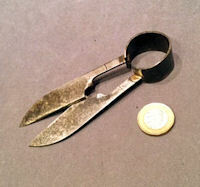 These were used to iron collars and cuffs, and earlier, used to iron ruffs worn around the neck. Lacking the heating poker, but otherwise all is complete and in good order. Base 2 1/8" diameter and 3.5" high. Price is for each. 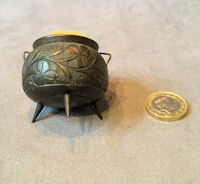 Original, quality late 19th century sewing pincushion carved in bog oak as a miniature cauldron with shamrock leaves around, turned legs and stamped "Made in Eire". In super condition. 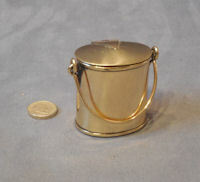 1.75" tall and 2" widest including wire side loops.